Srikkanth Anirudha's aggressive 77 launched Tamil Nadu to a comfortable 65-run victory against Karnataka in Hyderabad. 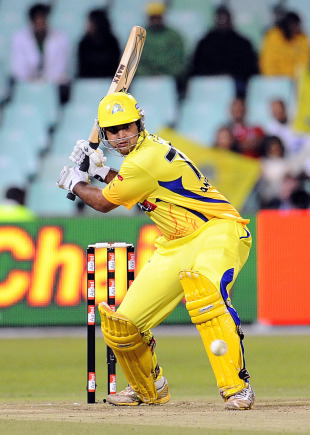 The win was Tamil Nadu's fourth on the trot, confirming their progress to the knock-out phase. Asked to bat first, Tamil Nadu's openers set the stage for a big score as Anirudha's pyrotechnics were matched by G Vignesh who raced to 42 off 23 balls. Vignesh hit three sixes and five fours as he dominated a 60-run opening stand. Anirudha took over once Vignesh exited, smashing six sixes and four fours before he fell in the 17th over. Karnataka captain Sunil Joshi came unscathed through the carnage, with figures of 2 for 26 in his four overs, while medium-pacer B Akhil bled 67 runs in his spell - equalling the record for most runs conceded in a Twenty20 - as Tamil Nadu finished with 205 for 7. Karnataka lost ground early in the chase as the openers Manish Pandey and Mayank Agarwal fell for a combined contribution of one run. Following L Balaji's miserly opening spell, Tamil Nadu's seamers stuck to their task as Karnataka struggled to launch an offensive. Joshi was the only batsman to cross 30 after a shoddy top-order display as Tamil Nadu eased to another convincing win. T Suman's opening blitz helped Hyderabad surge to 62 for 6 in a rain-reduced five-overs-a-side encounter, a score that they defended by 14 runs against Goa at the Rajiv Gandhi International Stadium. Goa's decision to field came unstuck against Suman's fierce onslaught. He hit four sixes and two fours in the 16 balls he faced and scored 38 before falling in the final over from Sher Yadav. Hyderabad lost two more wickets and managed only five runs in that over, but that did not affect the final result. The second over of the chase from Pagadala Naidu pulled Goa back as he snared three wickets conceding just five runs. Sagun Kamat and Robin D'Souza were the only batsmen to cross double figures as Goa struggled to find the big hits. Amol Shinde sealed the result with a nerveless final over that yielded only five runs, leaving Goa well short. Andhra remained at the bottom of the table after their match against Kerala at the Gymkhana Ground was called off due to rain.